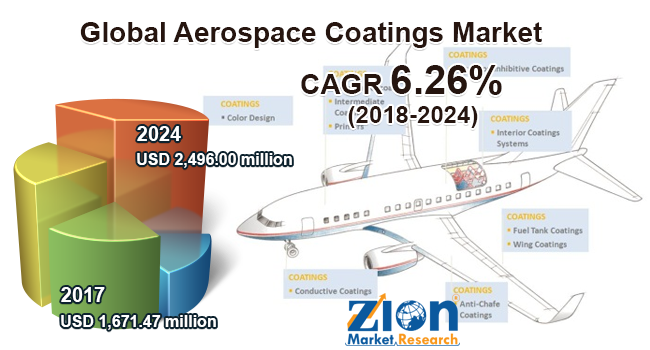 Zion Market Research has published a new report titled “Aerospace Coatings Market by Resin (Epoxy, Polyurethanes, and Others), by Technology (Powder Based Coatings and Liquid Coatings), by Application (Interior and Exterior), by End-user (Commercial Aviation, Military Aviation, and General Aviation): Global Industry Perspective, Comprehensive Analysis, and Forecast, 2017 - 2024”. According to the report, global aerospace coatings market was valued at approximately USD 1,671.47 million in 2017 and is expected to generate revenue of around USD 2,496.00 million by the end of 2024, growing at a CAGR of around 6.26% between 2018 and 2024. The rapid technological advancement and continuous innovation in the product have led to the upsurge in the paint and coatings industry across the world. The introduction of low VOC content and chrome-free coatings coupled with the evolution of environment-friendly coatings are fueling the growth of the market. In addition, the rising civil aviation owing to the development of new airports and air services in developing countries such as India and China is propelling the growth of the aerospace market. The usage of nanotechnology in aerospace coatings is going to put a positive impact on the growth of the market. Moreover, rise in usage of coatings in spacecraft and increasing passenger traffic across the globe due to cheaper airfares has led to increasing demand for airplanes further supporting the aerospace coatings market growth. Prosperous growth in global trade has resulted in the development of commercial aircraft thus fueling the development of the aerospace coatings market. The government organizations across the globe are significantly investing in the aerospace sector which is contributing towards revenue generation of the market. For example, in 2014, China invested over USD 4.75 thousand million in aerospace & aviation industry to cater to the growing demand for air traffic in the region. In addition, the introduction of substitutes due to the rising fuel prices such as composite fuselage designs may restrain the growth of aerospace coatings market. Such factors are expected to drive the aerospace coatings market growth over the forecast period. The aerospace coatings market is segmented on the basis of resins into epoxy, polyurethanes, and others. Polyurethanes segment held the major revenue share in 2017. The growth is due to the increased demand for polyurethanes since it is good against corrosion, abrasion, wear and tear, and chemical. Also, they are cost effective in nature. Based on technology, the aerospace coatings market has been segmented as liquid-based coatings and powder-based coatings. Liquid-based coatings are expected to drive the growth of the market. This growth is attributed to the increased demand for the liquid coatings as they provide better metal protection, corrosion resistance, and an excellent smooth surface finish. Also, the liquid coatings are environmental friendly in nature. Based on applications, aerospace coatings market has been categorized into interior and exterior. The exterior segment is expected to have the largest share. This growth is anticipated to its increasing usage in structural applications in aircraft. Coatings offer protection to the exterior aircraft including erosion, deterioration, and cracking. Based on end-user, the aerospace coatings market has been divided into commercial aviation, military aviation, and general aviation. Commercial aviation is expected to grow at a significant rate in the forecast timeframe. The growth is attributed because of rising passenger’s affordability for air travel and frequent overseas trade stimulates the growth of the commercial segment. Asia Pacific is growing at significant and fastest CAGR rate in the global aerospace coatings market in 2017 and the region is expected to continue with its regional superiority over the forecast period. The growth of this regional market is attributed to high demand coming from India, China, Vietnam, Singapore, and South Korea. Moreover, Singapore and Malaysia are the nations which are considered for providing MRO services to regional and international airlines. These factors are anticipated to further drive the industry growth in the region over the forecast period. The Middle East and Africa region are predicted to provide significant opportunities for aerospace coatings. The increase in the air traffic in the region is expected to fuel the market. Some of the industry players operating in the aerospace coatings market include Hohman Plating & Manufacturing LLC, NVSC Specialty, Asahi Kinzoku Kogyo Inc., Cheaerospacel, AHC Oberflchentechnik GmbH, Argosy International, International Aerospace Coatings Holdings LP, Brycoat Inc., Coatings, Merck Performance Materials, and Zodiac Aerospace.